The (UK) print media has covered the events and out of the four main national broadcasters, the smallest one, ITV, has given it reasonable airtime. The BBC, however, appears to have gone silent on or around December 15th. That’s when a video was broadcasted from which we have taken the above screenshot (pictured). Since then, there has only been one video broadcasted by BBC where a French policeman draws a gun on a protester without shooting it. 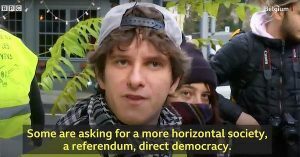 The other main national broadcaster, Channel 4, has given no airtime whatever to the yellow vests as far as we can see from Youtube searches where they post daily their videos. This complete silence has given rise to rumors that a d-notice has been issued probably around December 15th. Two days ago, we could not confirm a widely shared claim the British press had gotten a D-Notice ordering a clamp on any coverage of the Yellow Vest movement in France. But what there is no doubt of is the prevalence of such D-Notice orders – media gag orders, which prohibit or greatly direct the coverage of certain matters of public interest, normally covered by ‘free’ media, but in fact we find something rather ominous and indeed subversive to the work of independent media. There’s certainly been the look and feel of what amounts to a media gag order surrounding the coverage over these yellow vest protests that it raises serious questions. Where we have seen coverage in the British press, it’s been sensationalist, distorting, and carries a derisive tone. Consistently painted as a fringe movement either controlled or infiltrated by the far-right, or conversely, by Russian ‘agents’, bots, hackers (how?!) – coverage in the UK has ignored the popular, left-wing, and more over indigenous nature of these protests. The real issue is that this is beyond the scope of speculation, let alone paranoia, and rather indeed has us look at what is already known on the subject. While there are myriad government agency departments dedicated to messaging, surpassed only by parallel institutions working in lock-step in the private sphere, this apparent gag order in place in British media not only demonstrates the role of the ‘Deep State’, the MI5 and MI6 in shaping public media discourse, but urges us to take a look at the in-depth break down of this system which was explained by German journalist Udo Ulfkotte, in his work Paid-for Journalists (Gekaufte Journalisten). A DSMA-Notice (Defence and Security Media Advisory Notice) — formerly a DA-Notice (Defence Advisory Notice), and before that called a Defence Notice (D-Notice) until 1993—is an official request to news editors not to publish or broadcast items on specified subjects for reasons of national security. The system is still in use in the United Kingdom. It should probably be mentioned here of course that it would be unthinkable, given that such a system is in place, that it would not have also been used in the case of the Skripals. The specious claims made by UK authorities, and the manner by which all British media unanimously became little more than stenographers for the significantly flawed and narratively bankrupt official line, pushes us here: the D-Notice isn’t a one-off emergency protocol used once in a blue moon, but apparently, increasingly so a part of every-day life in UK media. The author has long suspected that the US has such a system in place, simply from comparing world news (which I monitor in 6 languages) to what gets covered in NPR. There is something in the Russiagate theme daily, but nothing about Israel and Gaza, or Israel attacking Syria, or about the huge Yellow Vest demonstrations in France, and nothing either about the Storm-Trooper-style police repression of same. There has to be a gag order on what Kiev is doing to civilians in Lugansk and Donetsk, issued behind the curtain. Journalists manipulate us in the interests of the powerful. Do you, too, have the feeling that you are frequently manipulated and lied to by the media? Then you feel like the majority of Germans. So far, it has been a “conspiracy theory” that the leading media manipulate citizens with propaganda techniques. Now an insider reveals what’s really happening behind the scenes. The journalist Udo Ulfkotte is ashamed of working 17 years for the Frankfurter Allgemeine Zeitung. Before the author reveals the secret networks of power, he consistently practices self-criticism. Here he documents for the first time how he was greased for his reporting in the FAZ and how corruption was promoted. And he reveals why opinion leaders report tendentiously, and how the extended arm of the NATO Press Office prepares wars via the media. As a matter of course, the author was included in the networks of American elite organizations, in return for positive coverage in the US, even receiving an honorary citizenship certificate. In this book, you will find out which lobby organizations are represented by which journalists. 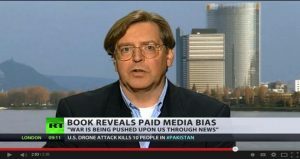 The author mentions hundreds of names and also looks behind the scenes of those organizations that influence our media with one-sided propaganda, such as: Atlantic Bridge, Trilateral Commission, German Marshall Fund, American Council on Germany, American Academy, Aspen Institute, and Institute for European Policy. It also reveals the intelligence behind lobbying groups, the propaganda techniques and forms that can be used, for example, to obtain funding from the US Embassy for projects aimed at influencing public opinion in Germany. If the CIA dictates what is written, can you imagine secret service staff writing texts in editorial offices that are then published in the editorial section under the names of well-known journalists? [*] Do you know which journalists were greased by which media for their reporting? And do you have an idea of how prestigious »Journalist Prizes« get awarded? It goes on in the background like the former honors of the “heroes of work” in the former GDR because their propaganda work is excellent. It’s not far from journalist to propagandist. If you’ve read this book, you’ll see our newspapers in a different light, switch off the TV more often, and know what else to think of the radio: almost nothing. Because Ulfkotte also writes down meticulously which station belongs to which political party and which journalists are influenced. You realize how you are being manipulated and you know from whom and why. In the end, it becomes clear: Opinion diversity is now only simulated. Because our “news” is often pure brainwash. **Edward R. Murrow, in London, has no idea who is dropping the bombs. This was reprinted here. Our FRN version has the date of the last edit. *Anderson Cooper, while in college, worked two summers as an intern with the Central Intelligence Agency. It is noted in his Wikipedia entry.